Princess Madeleine of Sweden and her husband Chris O'Neill have named their daughter Leonore Lilian Maria and she will be given the title of Duchess of Gotland. 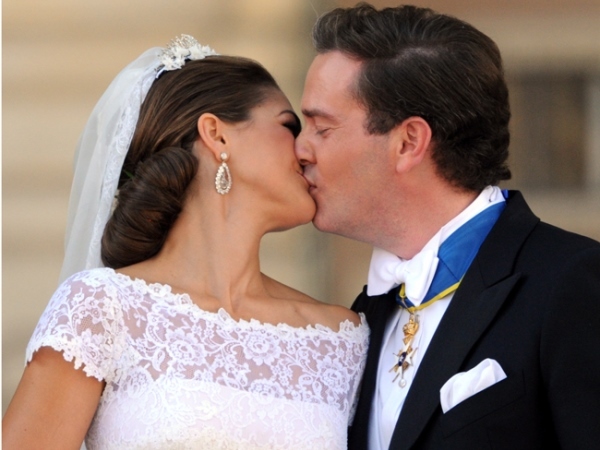 Sweden's Princess Madeleine and Chris O'Neill have named their daughter Leonore Lilian Maria. The six-day-old child's moniker Lillian, pays homage to the late Princess Lilian of Sweden who passed away aged 97 in March last year, while it's believed Maria may be in honour of Chris' mum Eva Maria. The tiny tot's name is only held by 128 women in Sweden, according to national statistics, and royal expert Roger Lundgren agrees the name is an unusual choice. He told Swedish newspaper, Aftonbladet: "It's definitely something new. There aren't many Swedish girls called Leonore." The royal, who is fifth in line to the throne, will also be given the title of Duchess of Gotland, it was revealed at a meeting of the Cabinet Council held by King Carl XVI Gustaf and Princess Victoria on Wednesday. Shortly after Princess Madeleine gave birth in New York on Thursday her parents King Carl and Queen Silvia jetted to the United States to meet their granddaughter. Speaking of the baby's arrival, they gushed: "We know today both happiness and warm thanks. Our joy is great. We wish now that Princess Madeleine and Christopher get peace and quiet and can take advantage of this unique time with her little daughter."